I am in Valencia for a few weeks, before flying to Poland to visit a string of small cities there. I am staying at the edge of Valencia, actually, in a small town called Nazaret. It is just a few streets wide but it includes Valencia’s huge port, so against the skyline you see the not so attractive cargo cranes. The port is one of the largest in Europe. There is a regular line of ships waiting foir a spot, while some 600 cruise ships disembark thousands of passengers for short tours of the historic center. Nazaret has many civic groups, many of the secular and a few religious. Among the former is the music association, common to many small towns in the province of Valencia. There are some 800 municipal symphonic bands, one of Valencia’s cultural treasures. Last night a religious group sponsored a paella party. 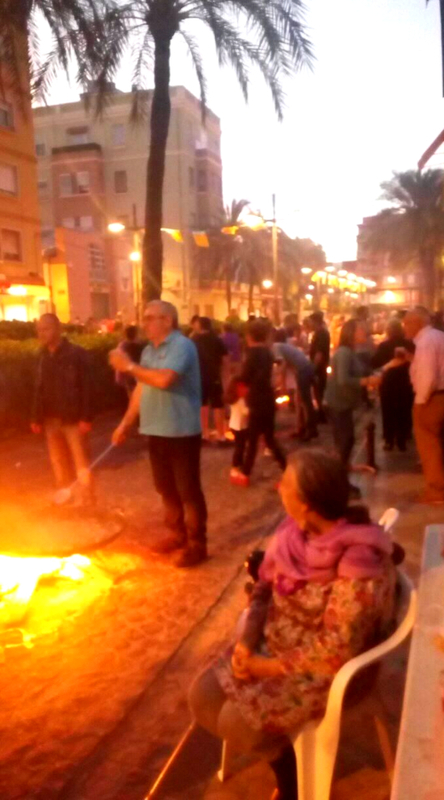 This being Spain, it did not get started until 9 pm. 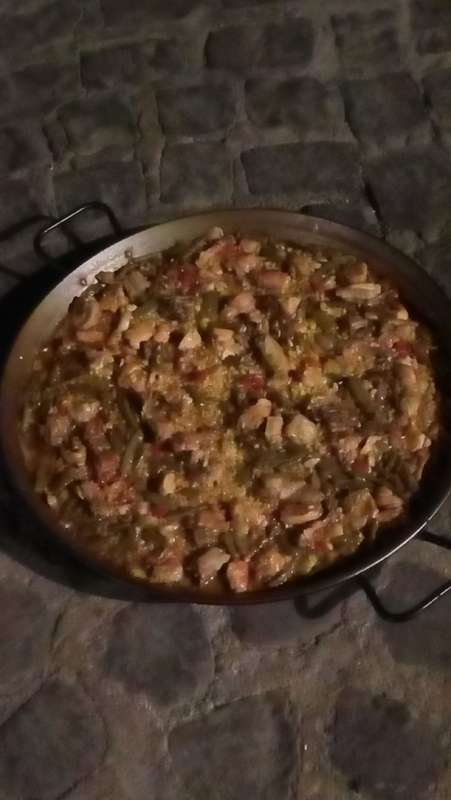 The paella was ready a bit after 1100, cooked over wood fires set on the stone streets. To keep the stone from scorching they spread small piles of sand, upon which the wood is placed. They fiddle a lot with the fires even after they burn down to coals, moving and adding wood to keep the heat in the proper range. Everyone stands about drinking wine, sangria, beer, water or soft drinks, munching on potato chips, almonds – they grow in abundance here – sunflower seeds and whatnot. This is while offering advice to the chef, unbid perhaps, on how much flame, salt or what have you is needed. Everyone or at least his or her mother does paella at home. Paella is a fixation of Valencianos, not the Spanish as a whole, and most households don’t let a Sunday go by without one of the 5 major variations finding its way to the table. Kids from age 8 or so on up were running about the plaza during all of this cooking. I am not sure if they even stopped to eat any paella. Paella at this time of the day is not common. This dish is too heavy, they say. But this is a special occasion, and there are hundreds at the tables. There are two ways you share the paella. You can have it served onto a plate, or eat right out of the paella pan. Of course if you are too far away from the pan, you get a plate. I may have invented a third method, which combines one and two. I grabbed a plate to avoid dropping food on my trousers. There is a good amount of oil in this paella so extra caution was called for. So everyone talks to one another, well more or less, as certainly there are relationship issues. As a general rule in Spain, any excuse for a party will do, and friendly chatter is the general rule. Since I am not from around here, although not by any means the only foreigner, I did get some extra attention, mostly of the where are you from variety. Ximo, my host, explains how we met in Florida in 2005, at an international folk dance event. His parents hosted us for a few days on our first visit here in 2011, while we looked for an apartment. On several occasions his mother made us paella in the small garden behind their house- they have a small farm outside of town with almond trees and artichokes to care for. He and Andrea is hosting me for my short visit this time. I’ll write a few notes about our tapas adventures in the near future.